Oh my it’s been a good day of creating. Got some writing accomplished – not including this post – and have been painting up a storm. I took Connie Hozvicka’s advice and redid the exercise that got me whining about plaid. My first attempt at the exercise seemed boring and dull, not fluid, which was the intent. My resistance revealed the need to do the exercise again, push my limits and adopt beginners’ mind. The second time around got me reveling in joyous flow, splash, dash and pounce. I changed everything about my approach. Instead of standing, I lay the painting board on the floor, changed the lighting, knelt on my knees, stretched, rather than circumnavigating, in order to paint the far off corners. This is a BIG painting remember. I felt like I was doing the yoga pose downward dog a few times there, which felt good and accomplished two things at once! I felt the urge to stand up and fling color and so I did. I found my big plastic sheet and spread it out and went to town hurling away using both hands to switch it up and keep both sides of me involved. Mostly orange and black at the bottom of the painting. And the coolest thing is that I still have weaving lines but this time they happened without me noticing until the very end of the process. They arose organically in other words. And when I realized I’d woven threads again, I didn’t care if they weren’t accurately warping and woofing. I found myself humming as I worked and even noticed I was sticking out my tongue the way kids do when concentrating on a task. Freedom, all I want is freedom. Freedom comes from not hanging on, you gotta let go, let go. I sang it for a few minutes to my black dog, who gazed deeply into my eyes – with perplexity. 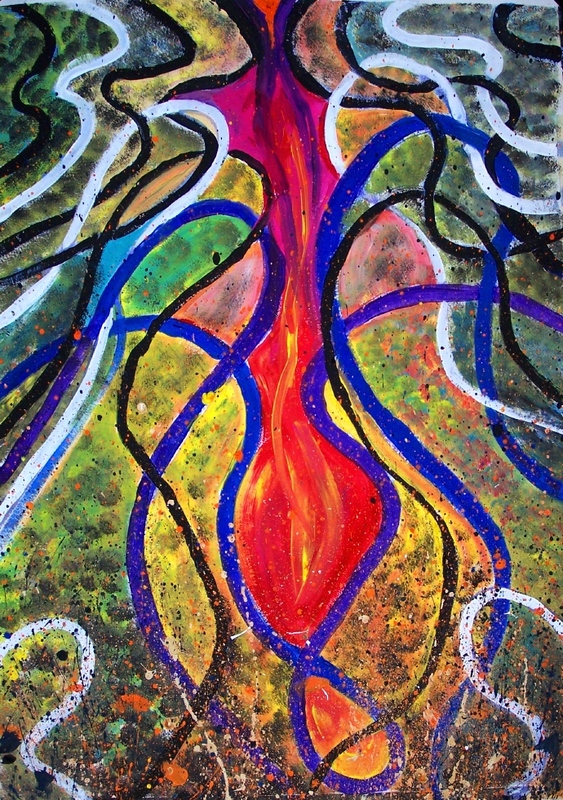 I call the painting, Inner Flame. This entry was posted in truth, wonder and tagged being in the flow, change, openness, splash paint, taking off. Bookmark the permalink. I’d like to hear that chant too! P.S. Your painting makes me feel happy and alive and healing!!! Thank you! Thank you thank you Lucy. I love it when my body sings with focused delight. And I wish you could have seen Taka – he took my singing with great seriousness but I also interpreted his body language as telling me he was uncertain of how he should respond. VERY dynamic. Instantly, it reminded me of having ones backside up to the campfire, smoke and flame rising, Nature all around, holding.